The name on this thing is somewhat ambiguous - the DVD is simply labeled "Saturday Night Live Christmas", but the special includes the word "Past." I'm going with that, because it's a more interesting name. I'm pretty sure I saw this compilation when it aired in 1999 (the selection of shorts was really familiar). It's a mix of old stuff, along with stuff that was new when it aired, but is now just slightly less old. In total, there are 18 skits on this DVD, which comes out to around an hour-fifteen. They didn't bother including any extras, which is a little baffling. 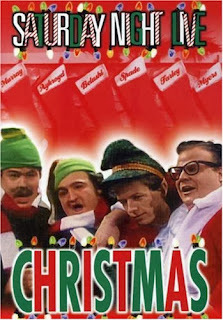 The skits aren't all great, but with twenty-four seasons of holiday shows to pick and choose from, they were certainly able to find some entertaining bits. Like most SNL compilations, this makes the show look a hell of a lot better than it's ever actually been. There are a handful of high points, including "The Lost Ending of It's a Wonderful Life," where SNL gives the movie the ending generations have wanted to see. I also loved "Deserted Island Christmas," about a couple exchanging gifts after being shipwrecked. On the other end of the spectrum, this includes several segments which haven't aged so well. I remember finding Dana Carvey's Church Lady funny when I was young, but... not so much now. I don't think I ever found the fake NPR skits funny, and re-watching the "Schweddy Balls" puns didn't change that. As for Adam Sandler's Hanukkah Song, it remains fascinating as a historical pop-culture oddity but certainly doesn't explain why Sandler was ever popular. This is a fun collection highlighting some of SNL's best (or at least most memorable) holiday skits, and there are enough good moments to make this worth watching.